Dr Caroline Leaf: All scare and no science? 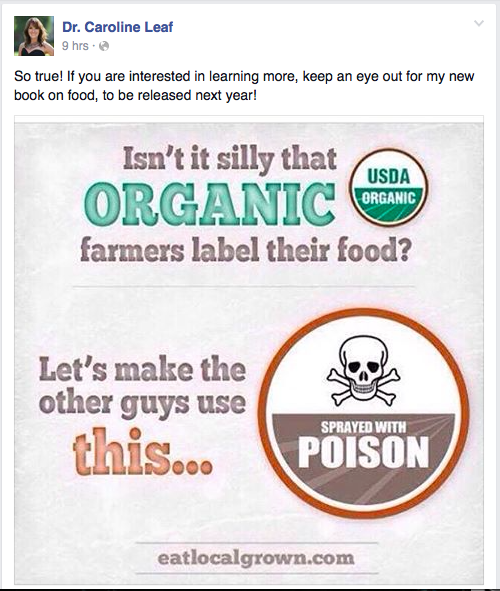 On her social media feed today, Dr Leaf posted a meme implying that conventionally farmed food was toxic. Dr Caroline Leaf is a communication pathologist and self-titled cognitive neuroscientist. Anyone who’s been following Dr Leaf will know from her frequent food selfies that she is an organic convert. Dr Leaf is welcome to eat whatever she chooses, though not content to simply push her personal belief in organic foods, Dr Leaf is now actively criticising conventional food, publishing memes on her social media posts which imply that conventional produce is poisonous. As I’ve written before, despite Dr Leaf’s blinding passion and quasi-religious zeal for organic foods, there is no evidence that organic food is any more beneficial than conventional food (Dangour et al, 2009; Bradbury et al, 2014). Indeed, there’s no magic to a healthy food lifestyle. Eat more vegetables. Drink more water. Conventional veggies and conventional water do just fine. Sage advice, even if it doesn’t lend itself to food selfies. While organic zealots believe they have the high ground on the topic of food safety, the published science cuts through the hype. As noted by Smith-Spangler et al (2012), there is some evidence that there may be less pesticide residue on organically grown foods, but there is no significant difference in the risk of each group exceeding the overcautious Maximum Residue Limit. 2. Organic foods have pesticides too. Granted, this is at lower levels than their conventional counterparts, but it’s there all the same (Smith-Spangler et al, 2012). I once had a lively discussion with an organic food zealot about the pesticides in organic farming. Her argument was that organic pesticides are safe because they’re “natural” poisons. So are arsenic, cyanide, belladonna and digitalis (foxglove), but why let the truth get in the way of ones opinion. Poisons are poisons whether they’re “natural” or not. The Maximum Residue Limit applies to organic foods just the same as conventionally farmed produce for that reason. Another interesting thing … in the Choice survey, the organic grapes had no detectable pesticides, but so did conventionally farmed grapes bought at a local green grocer. So organic food zealots can’t claim that they have a monopoly on low pesticides in their foods. Not that having lower pesticide residues means that organic foods are necessarily safer. Organically farmed produce has a higher risk of contamination from E. coli and other potentially toxic bacteria, depending on the farming method used (Mukherjee et al, 2007; Sample, 2011). So to bring it all together, conventional produce has levels of pesticide residues so low that it would take an extra-ordinary feat of vegetarian gluttony to exceed a level that was still found to be non-toxic in animals. The risk to human health from conventional farming with pesticides is nanoscopic. Organic foods may have less pesticide, but they have a higher risk from enterotoxigenic bacteria. Posts like today’s make Dr Leaf seem like all scare and no science. Publishing images with the skull and cross bones and the word “POISON” is certainly not attempting to allay anyone’s anxiety, and that fact that it‘s directly tied to a reminder of her upcoming book on food only makes shameless promotion all the more likely. I’m sure that a Godly woman of Dr Leaf’s standing wouldn’t stoop so low as to use fear and mistruth just to make better sales, but posts like today’s open her up to legitimate questions from others regarding her credibility and her motivation. For her sake, I hope that she tightens up her future posts, and reconsiders her stance on the science of organic and conventional foods. Smith-Spangler, C., Brandeau, M. L., Hunter, G. E., Bavinger, J. C., Pearson, M., Eschbach, P. J., . . . Stave, C. (2012). Are organic foods safer or healthier than conventional alternatives? A systematic review. Ann Intern Med, 157(5), 348-366. This entry was posted in Biological, Caroline Leaf and tagged cancer, caroline leaf, Choice Australia, cognitive neuroscientist, criticism, dr caroline leaf, Facebook, fear, food, marketing, organic, pesticide, poison, residue by cedwardpitt. Bookmark the permalink.